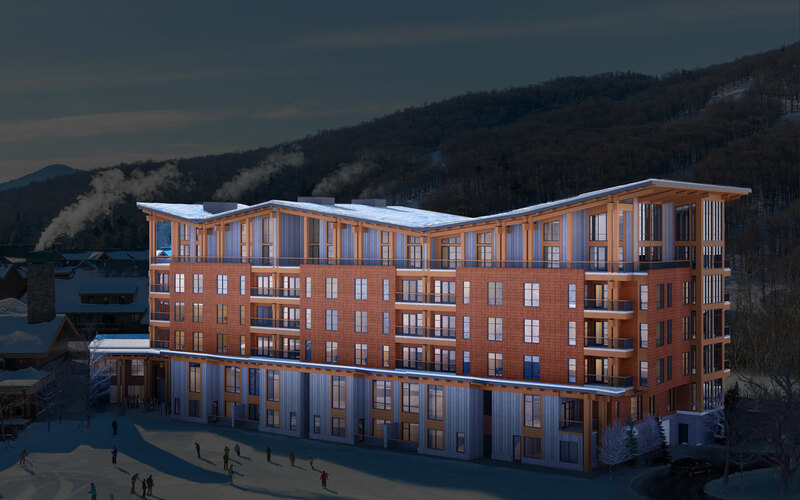 Nestled between the slopes and Spruce Peak Village, One Spruce Peak is the pinnacle of alpine living in Stowe, Vermont. Featuring 27 ski-in/ski-out luxury mountain retreats with elevators that deliver you from your front door directly to the mountain's base, this collection of homes includes residences, townhomes, and penthouses up to 5,000 SF. Made in Vermont by Conant Metal and Light Black steel fixture with frosted and clear glass. The Kitchen Pendants and Foyer Pendant are designed by Conant Metal & Light in conjunction with TruexCullins, and will be fabricated at Conant Metal & Light in Burlington, VT. The pendants will feature custom, hand blown glass by AO Glass of Burlington, Vermont. Oak kitchen cabinetry and panelized appliance veneer, customized for each home. Honed Vermont Danby Imperial Marble. The Imperial Danby used in the kitchen counter and backsplash and the Montclair Danby Marble used in the Master Bath are quarried in Danby, VT inside the only underground marble mine in North America. Danby marble is considered one of the most durable white marbles available and is exported all over the world because of superior physical properties and beauty. Reclaimed Chestnut in Vermont Natural Coatings. The Farm Table kitchen island's reclaimed* Chestnut counter top provides a warm and inviting place for gathering and dining. The base cabinets below are contained in a dark stained wood enclosure to visually disappear against the lighter table top, legs, and stretchers. The size and seating capacity of the Farm Table also allows the owner to eschew a traditional dining area in the Great Room and repurpose it for another use. Our residences feature floor-to-ceiling windows up to 20' high. Kitchens are designed to be the heart of the home; perfect for family dinners. The spacious outdoor terraces provide ample entertaining space, and the contemporary alpine design connects you directly with the mountain. Made in Vermont by Conant Metal and Light, Black steel fixture with leather strapping, and seeded glass. The Kitchen Pendants and Foyer Pendant are designed by Conant Metal & Light in conjunction with TruexCullins, and will be fabricated at Conant Metal & Light in Burlington, VT. The pendants will feature custom, hand blown glass by AO Glass of Burlington, Vermont. Each Residence features direct elevator access to your personal home, providing easy access to your foyer/mud room, with built in lounge area, custom closets, and deluxe fixtures. The Montclair Danby Marble in the Master Bath is quarried in Danby, VT inside the only underground marble mine in North America. Danby marble is considered one of the most durable white marbles available and is exported all over the world because of superior physical properties and beauty. The bathrooms for each unit are oversized, modern, and highly elevated with deluxe marble counters, step-in showers, and top-of-the-line fixtures throughout. You’re steps away from the vibrant Spruce Peak Village, where shopping, dining, and family activities abound. Take in a show at the Spruce Peak Performing Arts Center. Relax at the Spa. Connect with friends at the Club. Create family memories. Overlooking Mount Mansfield, the exclusive Club members-only private pool features cabanas, entertainment areas, and infinity style design. The pool deck is designed for year-round use with exclusive heated tiles. Living at The One provides you with the ultimate Spruce life, and when combined with a Club Membership, you also have access to members-only Club amenities including the private Alpine Clubhouse, personalized concierge services, the 21,000 square foot spa and wellness center, ski lockers, the 18-hole Mountain golf course, and incredible family programming. All 27 private residences include dramatic and exceptional views of Mt. Mansfield from the great room and expansive balconies, while views of the Spruce Peak ski trails are prominent from the bedrooms. All residences include in-residence elevators that deliver you from your front door to the mountain’s base; spacious balconies, sweeping floor-to-ceiling windows; top-tier wood flooring and wood-ceiling details; and best-in-class materials including appliances, lighting, sound-proofing, and integrated technology. One Spruce Peak is your gateway to the Green Mountains and year-round Vermont adventure. Ski the iconic Mt. Mansfield slopes. Hike the Long Trail. Golf the pristine Mountain Course. Your endless adventure awaits. One Spruce Peak residents will live among the most amenities of any mountain village in the Northeast – shopping, numerous dining options, a Village ice rink, heated pool, performing arts center, spa and wellness center, a Bob-Cupp designed golf course, and a 20,000 SF members-only clubhouse.